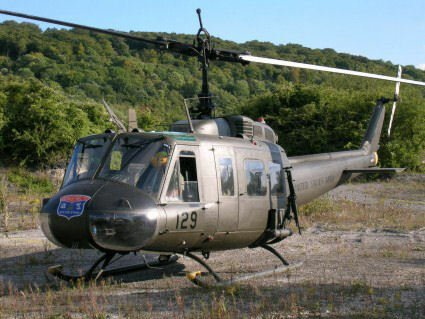 Earlier in the year we were contacted by a film production company asking if they could hire the huey as a film prop. 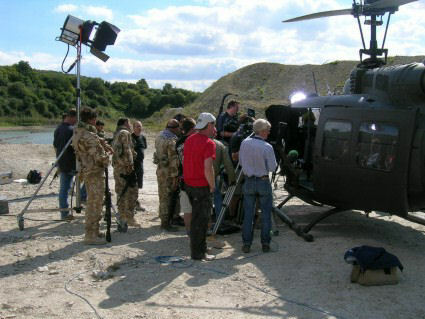 They wanted to use it for the TV drama series Ultimate Force. Of course we agreed! The filming took place at Chinnor, Oxfordshire, in a disused quarry. We flew down early on Sunday 7th August 2005 in glorious sunshine and arrived about 10am. 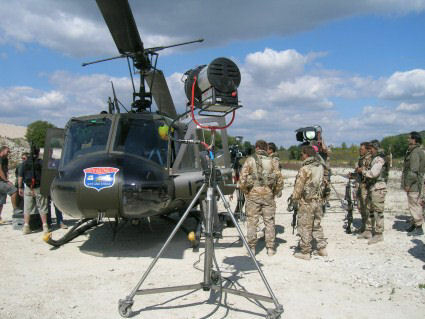 The film crew was already set up as they had been filming for a few days beforehand. We were offered tea and coffee and the obligatory bacon butties and asked to make our way to the wardrobe department! Due to the limitations of our licence we are not allowed to take any passengers, so for any action shots we, the flight crew, had to appear to be the characters! 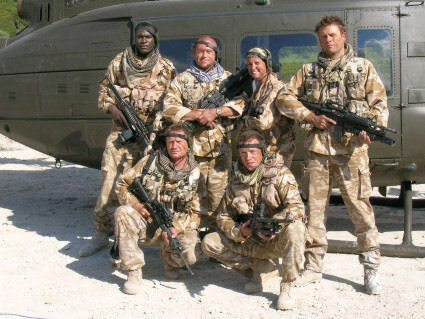 So were all decked out in desert combat gear then sent to the make-up department! The story line for this particular episode is set in Afghanistan and the quarry did look the part. We watched the filming of a few scenes with great interest. There were soldiers driving a jeep across the desert taking hostages, shooting guns with the director shouting ACTION! and CUT! None of us have ever been on location before so it was great fun to watch. We were given a splendid Sunday lunch cooked on site and served in an old converted double decker bus. All the film crew, makeup girls, wardrobe girls, and most of the actors joined us and we were given a fascinating insight into the making of films. Following lunch it was time for the Hueys debut! 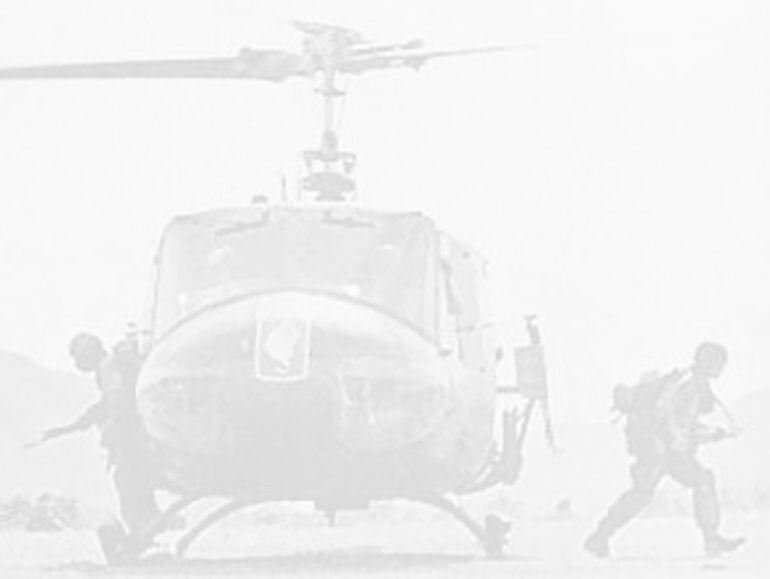 The director wanted to film her flying in and landing, collecting the troops and taking off again. The first part was easy. We flew into the site and landed perfectly making a huge dust cloud! 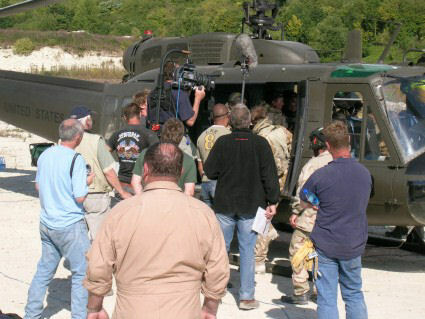 The second part took a couple of hours to shoot as the director wanted to film the actors getting into the helicopter from a few different angles. So, after a few takes we were all quite familiar with the script and indeed the actors! As we could not take passengers while we were flying, we had to assume the roles of these actors while the cameraman shot us as we took off! Im sure that no-one will be able to tell as we created so much dust again as we took off! We had a great day. Everyone we met was very excited about working with this fabulous helicopter and we had a lot of praise for it. It certainly looked the part, especially at the end of the day covered in dust! We would like to thank everyone involved for giving us this opportunity. 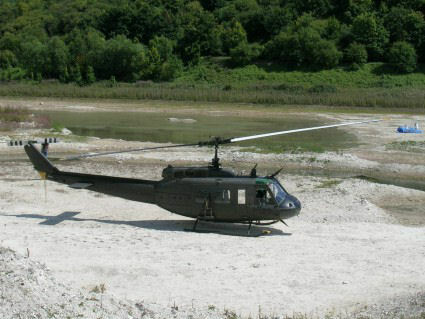 The series is due to start in Easter 2006 and the Huey will feature in the third programme of the series. Look out for it! !